I have noticed that Fired Okra is the most popular Okra Recipe in the US. 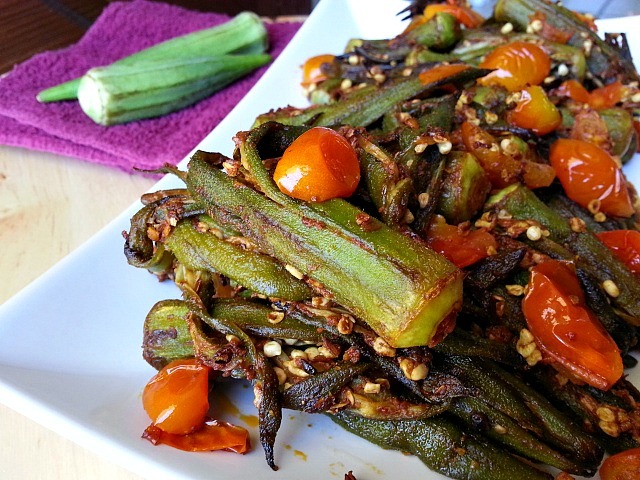 This sautéed Okra Recipe is a finger licking great alternative to the fried version. I usually land up snacking on it instead of eating it with my meal. Today when I tested the recipe I modified the method a little and did some addition and deletion to my usual recipe. I know it sounds too mathematical but I think I prefer the newer version where I added ripe cherry tomatoes from my garden and the acidity from the tomatoes balanced the spices better. I also skipped the turmeric powered that I normally use along with the dry coriander powder. So even though the ingredient picture may have these included you can exclude them and it will still taste awesome. This Image is without tomatoes in the sautéed Okra Recipe. This recipe will work better for those who have to avoid the Nightshade Vegetables. These are people who have joint pains. This is what you get by including the Cherry Tomatoes and excluding the turmeric powder and the dry coriander. 2 lbs of okra that is washed and slit. Wash the okra, slit the okra and let it air dry for about 20 minutes( It apparently reduces the slime). Heat oil in a non-stick pan. Add the cumin seeds and the okra and saute on medium heat for approximately 15-20 minutes till the okra is soften. The ends may brown a bit and it’s perfectly fine. Next add the xacuti masala, salt and saute for another 5 minutes. Finely add the chopped cherry tomatoes and saute till they are softened about 4-5 minutes. 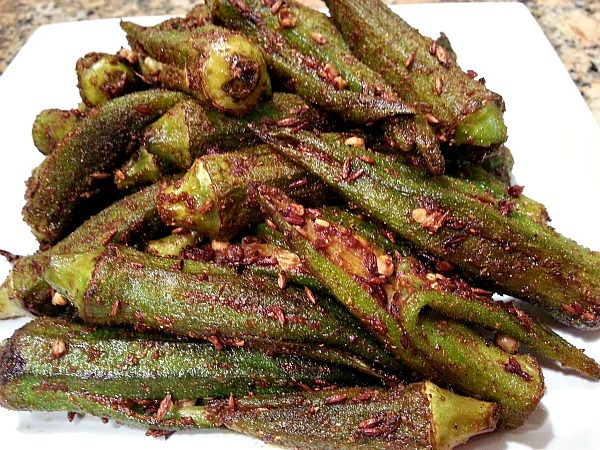 This Indian Spice inspired sautéed Okra Recipe is also commonly known as Bhindi Masala. On a side note in India, Okra is called Lady Finger in English. 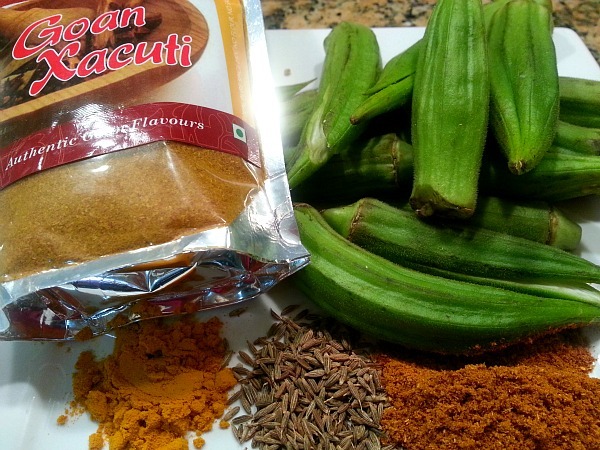 i love okra – where do i find xacuti masala? is that available in a regular super market or in places like whole foods? thanks! Okra…such a great vegetable! So many people I know are okra haters, but this looks seriously delish. Thank You! I appreciate your kind words :-). Love your Hebrew named blog. I hope you do give it a try Paige 🙂 The deep south recipe sounds yummy and very similar to an other recipe that we also make with okra, onions, tomatoes, turmeric and spices. Thank you so much for the like. This looks amazing! I enjoy okra too, and it is so versatile mixed in recipes or on it’s own. You are welcome 🙂 It is indeed. Delicious! My late mother and I love okra. My husband isn’t so keen. Thanks Eve Mel! Yes, Okra is an acquired taste as its a slimy veggie. This looks great! I’m always looking for ways to cook okra. Thanks for stopping by my blog and checking out the blueberry-lemon-zucchini loaf recipe. Wow these Bindi looks amazing! Just how my mum used to make them. My mouth is watering! Yum! This looks delish…could I make this with the pre cut frozen okra? Thanks Antonio :-). Good to see you back after a while. This reminds me so much of the sautéed Creole Okra from my childhood. I will be making this very soon! This looks delicious! Where can one buy the xacuti masala? Thank You Moira 🙂 You can get it at http://www.goanimports.com. Hope this helps. this sounds very good, will have to try it! I agree, there are lots of ways to eat okra without frying it in the classic southern (US) manner. I love them sautéed with tomatoes and onions or in an apegg fritata. That’s true Jonathan, okra is a flavorful veggie on it’s own and tastes great anyway you cook it. My next challenges is trying to grill it and see how it tastes. That’s a great choice Natasha as it is very versatile 🙂 Have a great trip. I love okra! One of the Indian restaurants on my block makes a wonderful okra dish. Every time I go I have the same thing over and over. sounds delicious! But why do you need to exclude the turmeric when adding cherry tomatoes? Thanks Joan :-). Since the spice mix has it. I have been looking for another recipe for okra! My husband loves fried okra, he will love this as well. Thanks for sharing. 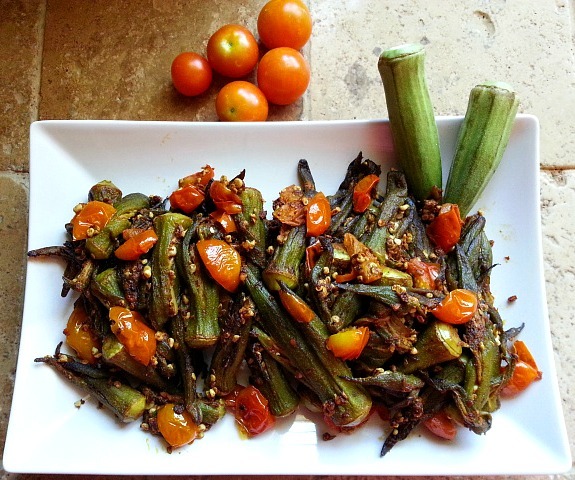 Thanks for liking my blog and for this recipe, I love okra, but don’t have it often enough, as I am the only one in my family who eats it. This is a must try. You are so weIcome 🙂 I too love okra. I’m lucky that it is popular in my house. Oh my! I must make this, soon! I love okra, and your recipe looks hearty and delicious! I found this post over at Goan Imports. Since I love growing and eating okra (as long as it is not slimy), I will give it a try. It looks delicious. I’ve always wondered how to use them; now I know and will try your dish. Thanks! I love to eat okra! It is one of the few crops that I can grow with success in the hot Florida summers. I like that your recipe seems to minimize the sliminess of the okra. Much healthier than fried, too. I saute my okra too, but am not nearly as exciting with the spices. I planted a row of okra about a week ago, hopefully I will have plenty to experiment with soon! I love Indian food but have never attempted to cook it as all the spices seems complicated but your lovely blog took me totally by surprise! Your recipes look stunning, delicious and simple to follow. Am so going to attempt some of them. Thank you so much for sharing and thanks for the LIKE on my blog. All the best! Awww… Thanks Veronica for your kind words 🙂 One of my purpose is to show how easy it is to cook Indian and Goan foods. I guess what make it sound tough is that we usually marinate our meats and fish before we cook but the cooking itself is so easy. That is awesome Carol, I hope you give it a try :-). Have a great weekend and God Bless. I don’t usually eat Indian food but I like lady fingers! This looks yum. Gotta try it some day. Kat, the veggie closer to Okra that I can think off is asparagus as its little fibrous and has a bit of slime. In-fact it taste very close to it. Fyi its also called as Lady Fingers. omg, omg, omg that looks so delicious! I grew up eating okra deep fried. Thanks for sharing this recipe! My folks are also from India (though not from Goa), so this looks similar to the kind of okra both my mom and my grandmother make on rare occasions since I’m the only one in my family who eats it (They like to make it spicy 🙂 ) But there’s not one recipe I don’t think they use; they more just feel their way to the taste they want using different amounts of spices and masalas.A published recipe is great to have on hand if I ever get the guts to try it! Thanks for sharing once again! You are so welcome :-). I hope you do try the recipe. It’s also great to know you have Indian roots. Awesome. I’ve never tried okra with xacuti masala. Sounds exciting. Looks great, especially the one with the cherry tomatoes. I’m not a fan of okra, but this dish looks awesome. My wife told me that nightshades and joint pain go together, but I can’t give them up. I may be hobbling, but my belly is happy. Ted you know your wife is right :-). My husband was recommended to avoid them by his Doctor. I’m gonna have to eventually give in, but I just love cooking with tomatoes and peppers. Maybe if I can find some balance.